After reading one too many painting guides and being fed up with not having the right colours for the model I decided something had to be done about it. I remembered I lesson learned at a very young age, that is that any colour can be made from the 3 primary colours, red, yellow and blue and also black and white. I decided to put this to the test and set out to see if I could make a few colours. I succeeded so I then produced formula, through many hours of testing for each colour that is featured in the ROTK rulebook, minus the metallics and inks. While I have tried to make sure that every colour is as close as possible I understand there may be some results that do not come out as expected. I have tested the paints once myself since doing them, and they have also been tested by another person, many thanks go to Silverscott for doing this. The colours you will need are Blood Red, Enchanted Blue, Sunburst Yellow, Skull White and Chaos Black. Unfortunate other paints cannot be substituted for these easily as the formulas will be wrong. 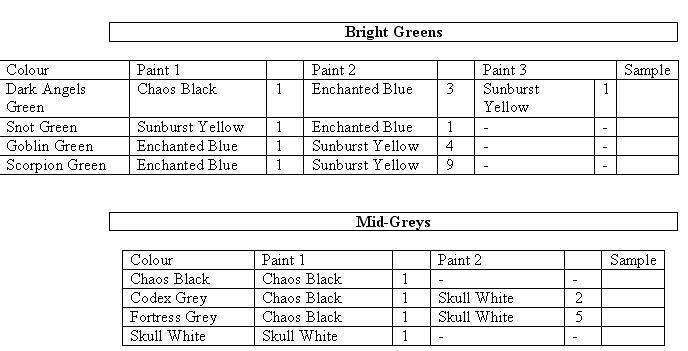 I would not recommend you use this chart to mix every colour you need, as the paints tend to dry out quickly when mixed so add some water to any paints you do mix. Here is an example of how to use the chart. So in this case to make Scorched Brown you would need 1 part of Sunburst Yellow, 1 part of Enchanted Blue and 1 part of Blood Red, mixed together. If the colour does not come out as expected (I find it is good to keep a sample of the colour so you can check it, or alternatively check with the paint list in the Return of the King rulebook) then if it is too light add a bit more of the darker colour, and if it is too dark add a bit more of the lighter colour. If you have any serious problems I would be happy to help. I can be reached at robertleyland@hotmail.com.